Most people don’t like to think about housecleaning, but it’s a necessary part of life. If we didn’t clean regularly, it wouldn’t be long before we were practically buried. Furthermore, allergy-causing dust would build up to potentially unhealthy levels. While regular cleaning is essential, it’s also important to do a more thorough cleaning from time to time. Many people choose the spring season to refresh their homes. If you’re like many people, the thought of spring cleaning is a bit overwhelming, but it doesn’t have to be. Before you tackle your next deep-cleaning project, check out our list of five tips that will help you do a better job, with less hassle. When you start cleaning, aim high. It’s usually best to start at the ceiling, and work your way down. This keeps you from having to clean and dust again to pick up any cobwebs, dust or other stuff that falls from the ceiling. A vacuum with a long extension hose is the best tool for this job. Start with the ceiling, then dust or vacuum your furniture. 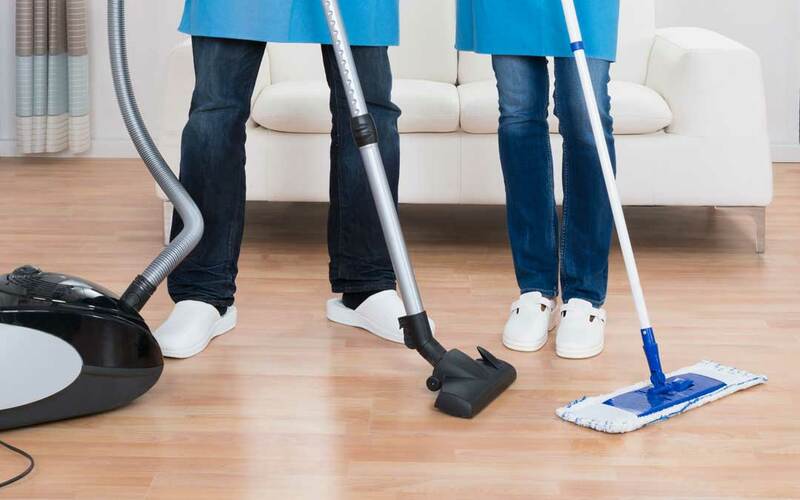 Finally, finish up by vacuuming or mopping your floors. When you choose a vacuum cleaner, be sure to opt for a HEPA filter. HEPA stands for High-Efficiency Particulate Absorption. A HEPA filter works by forcing air through a fine mesh, trapping harmful particles such as pollen, pet dander, dust mites, and tobacco smoke. Using HEPA filtration not only keeps allergens out of the air; it also traps bacteria that can cause illness and give make your house smell like a locker room. Most people vacuum regularly, and if your windows are dirty, it’s obvious. However, your walls get just as dirty as your floor and windows. Cleaning your walls is easy; just use a damp rag to wipe them down. For your windows, a steam cleaner and a squeegee are the tools you need. If you live in the United States, there’s a good chance that you have more stuff than you need. Extra stuff in your house not only makes your house look cluttered; it can actually add to your stress level. When you’re ready to get rid of your clutter, it’s probably easier than it seems. The easiest thing to do is to make three bins. Mark them “Keep,” “Toss,” and “Give Away.” Start in one room. Put each item in the room into the appropriate bin. When the bins are full, stop working, and deal with the full bins. After just a few short sessions, you’ll start to see a real difference. When you’re cleaning your house, don’t forget about your HVAC system. Replace your filters every three months or so to make sure you’re breathing clean, healthy air. Don’t let spring cleaning become a major chore. These tips can help you keep your home a stress-free, healthy place to enjoy life.